The Vegan Month of Food is over and I have to admit I was a little burned out at the end. I definitely needed a break from baking. And a cake break. But after almost two weeks of not baking and not writing anything, I think I should get back on track. Not with baking though. Not yet. Before September I started posting about some of my favourite food related places here in Dresden. P, F and I made some weekend trips to those favourite places, ate a lot and took pictures. Of course I didn’t get around posting about more than two of these places since I was “stuck” in the kitchen baking during September. I already promised that the German dessert project will be continued. But before we get back to you I want to introduce another one of my favourite places here in Dresden. 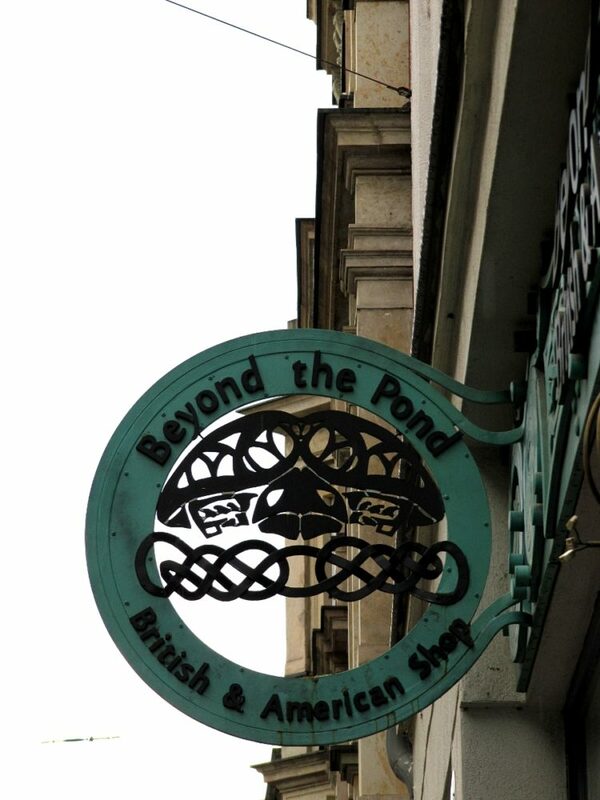 On of the stores in our neighbourhood here in Dresden-Neustadt I love most is called Beyond the Pond. 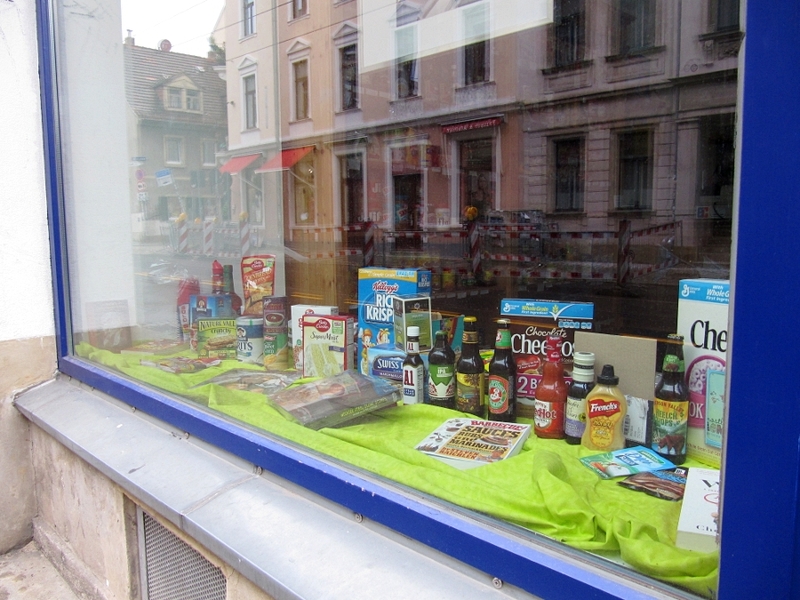 It is a cosy grocery store located at Rothenburger Straße 26. It was founded in 2010 by Michele Williams-Schmid, who is from the US and lives here with her family. 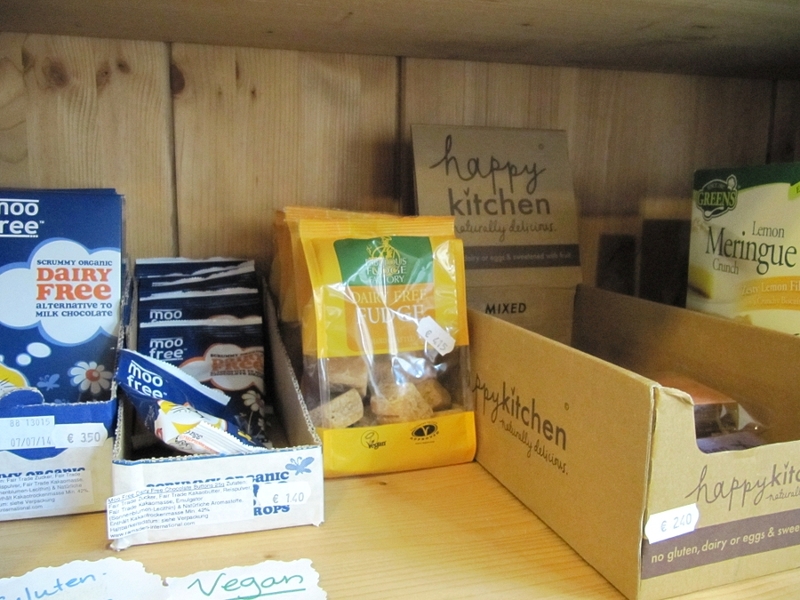 At her store you can get US and UK groceries, English books and cookbooks (some vegan ones, too! ), kitchen supplies like pie plates and muffin tins, greeting cards, tea, and so on. Whenever I walk by I like to check out the store window for new products. I cannot tell you how happy we were when we first discovered Beyond the Pond. My cooking is strongly influenced by all those US cookbooks I own and blogs I read. Plus I do a lot of testing. Before Beyond the Pond I had to order stuff like liquid smoke, vanilla extract, canned chipotles, “real” brown sugar, and similar things online. I often had to adapt recipes and get onto people’s nerves asking them how I could subsitute things like rice crispies, brown sauce or Old Bay seasoning. Often the answer was: “No substitute, sorry!”. So I had to get these things online from many different sites and stores. That included a lot of shipping and expensive shipping fees. Thankfully these times are over and I can save not only time but also money. The prices at Beyond the Pond are overall very decent, especially when keeping in mind that everything here is ordered from the UK or the USA. 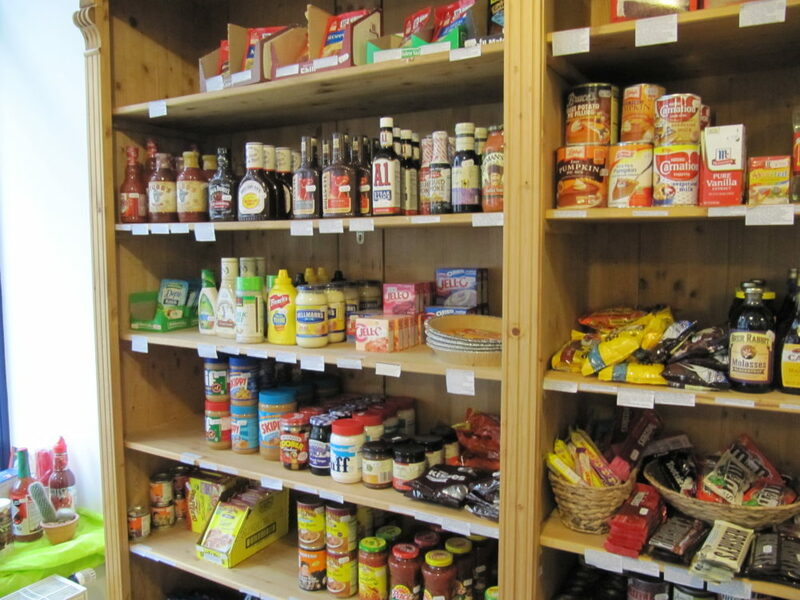 We often make a Saturday trip to Michele’s store, browse the shelves for new and interesting products, chat a little and stock up on hot sauce, liquid smoke, baking powder, and other stuff. The store is not vegan or vegetarian but the owner takes great care to provide ingredient lists in German which are stuck in front of each product. She is also very helpful and points out vegan products. Some of my personal highlights so far are: Lotus (Biscoff) speculoos spread, fig bars, flapjacks, Montezuma and Moo Free chocolate (P even bought me a vegan chocolate advent calendar last year! ), vegan fudge, Frank’s Hot Sauce, Bob’s Red Mill products, and hummus. Some products are even labeled as vegan. Those who are gluten-free will also find some great products at Beyond the Pond such as flour or baking mixes and Happy Kitchen brownie bars. If you enter the store the US products are on the left side and the UK products are on the right side. I find that very helpful whenever I am looking for something specific. 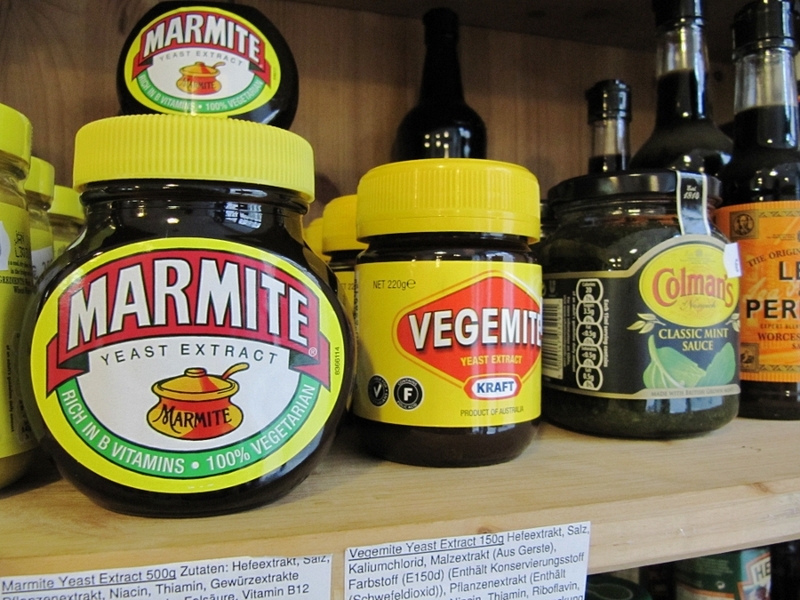 And for those who love Marmite and hate Vegemite or the other way round, Beyond the Pond stocks both! If you are in Dresden I can highly recommend a visit to this cute grocery store to stock up on some of your favourite products. Maybe you’ll also make one or the other new discovery. You can get there by taking the tram 13 and hop off at the stop Nordbad. You can also check out Michele’s facebook page for news, new products and opening hours. What a cool store! I knew there would be products that are hard to find in Germany, but I had no idea that brown sugar and vanilla extra were among those things. 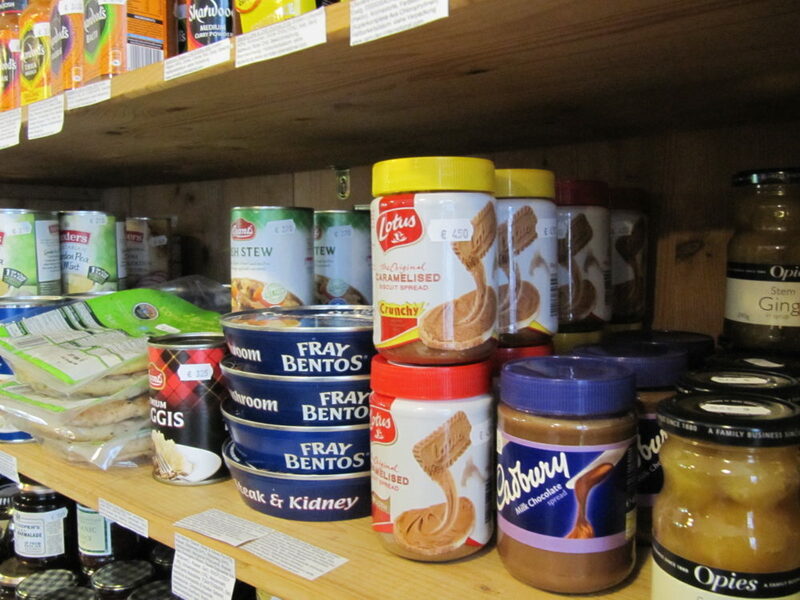 I love wandering around specialty stores like that, we have a Dutch one here where I like to get Speculoos, I always want to try everything there, except everythings in Dutch so it’s hard to figure out what’s vegan. Nice find! I’ve never heard of her store – I love that Biscoff spread, it’s so delicious and it’s also a Trader Joe’s product! Anyway, thanks for the mention! I love Vegemite, I had it in Australia and it was pretty tasty on toast and in savory appetizers. Ahh this store is so neat! And also such a brilliant idea. I have been ordering a lot of things I have read about in UK cookbooks online lately too! I was a little burned out to be honest after MoFo. I’m still recovering I think! This looks like a really useful shop to have on hand :) fun to see what UK products you have- I love Moo Free Chocolate too. Franks and Bob’s Red Mill are staples at our house. And we go to import stores here to get things from other countries! Have you tried Vegemite? I couldn’t imagine life without it (says the Australian). Me neither! Vegemite and avocado on toast is one of my favourite breakfasts (or snacks). Mmmm (says another Australian). No, I haven’t! But next time I’ll get a jar and try it. Sounds like an interesting shop – and it is interesting to hear about all the stuff you can’t get – I find that there are quite a lot of stuff in American recipes that I don’t have and mostly guess at – have recently bought my first bottle of franks hot sauce and still getting around to using it. We have a USA food shop in Melbourne but it is over the wrong side of the river for me so I have never got over there. <3 Vegemite! I had it on my 1st day in Sydney and it was the first thing the hotel would give you, haha! that is so fun. it is exactly how I feel when I see German products in an English store! What a fun store! And how nice that it’s so close to you. We lived around the corner when we visited Dresden and I loved it so much. I almost bought graham cracker pies but I didnt have any room left. Next time I will! Was ist denn das Besondere an diesem braunen Zucker? Da bin ich dann noch scheinbar uninformiert. Und das Glas Speculoos für 4,50, da fällt mir echt die Kinnlade runter :o Da dürfte das Importieren aus Belgien doch um einiges billiger werden, bei uns kosten die unter 2€ und die werden ja auch zu uns über die Grenze gebracht (und nach Deutschland ist ja noch immer in der EU…). Der braune Zucker ist Zucker, der mit Zuckerrohrmelasse versetzt wird und daher dunkelbraun und klebrig ist und nach Melasse schmeckt. Er ist viel feuchter als das, wass man in Deutschland als brauner Zucker kaufen kann. Mit dem Zucker hier habe ich z.B. Chocolate Chip Cookies noch nie richtig hinbekommen. Mit dem UK Zucker gehts aber gut! Die Speculoos-Paste kann man auch in Supermärkten kaufen. Da ist sie auch billiger und wahrscheinlich aus Belgien imporiert und nicht erst über UK.